Samsung Galaxy Tab 4 SM-T231 No Network Ways Solution – On this occasion we will try to discuss simple tips to solve the problems on the signal or network Samsung SM-T231 network or signal problems Full signal but can’ t receive calls or dial calls are often caused by several factors, one of them dropped out because of a signaling pathway. 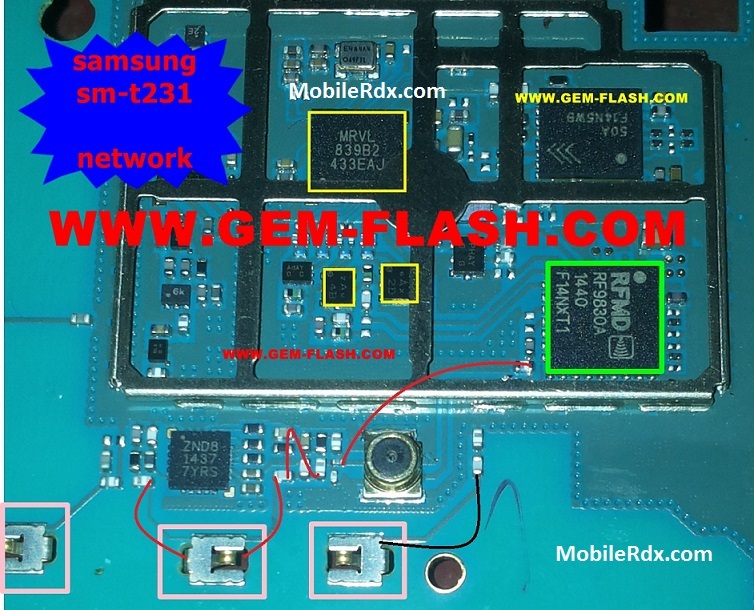 Here are simple steps that must be done to overcome the problems signal or network Samsung T231 . The first step is to check V+ Line whether the pin connections and the antenna is connected properly or not. If the pins are dirty or not well connected, do improvements in these areas. The second step is to check the antenna path as shown below. Check one by one if there is a spur that is broken or not, if there is a path-breaking try doing jumpers carefully and thoroughly. Tissue repair instructions or signals on the Samsung Galaxy Tab 4 T231. Check antenna paths are connected by a resistor. if the resistor is damaged then this fairly easy for us to change. Check the path from the antenna to the IC to the PA.
Also check the path of the IC PA headed to the antenna switch. see the picture above. Note: when we replace both component IC should be careful, if you use the heater for removal simply to reduce its volume. Thank you for visiting MobileRdx blog that addresses network problems or the signals do not work on the Samsung Galaxy Tab 4 T231. hopefully we can be a hint of a reference for you all.